The American Acoustic tour featuring Punch Brothers, I’m With Her, and Julian Lage wrapped last week in Utah. It was incredible to share the stage with these brilliant musicians but it was even better to have them cooking waffles for me every night backstage. 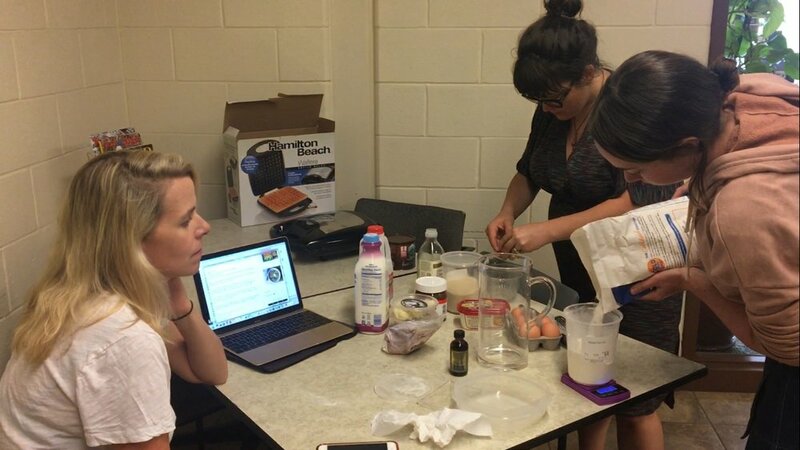 “I’m With Her” making nightly post-show homemade waffles for Noam Pikelny after his unprecedented donation to their Kickstarter campaign. In other news, I’ll be hitting the road again this fall for some solo shows. The dates are listed below, and all tickets are now on sale. Earlier this year I sat down with the fine folks at Reverb.com and asked them to ban me from making impulse purchases on their site. They graciously agreed to do so in exchange for a video describing various styles of banjo playing. If that's too academic for you, but you still want a refresher of what solo banjo sounds like before committing to a show this fall, here's a live video of "Hen of The Woods" filmed at Paste Studios in NYC. If you ask me, nothing beats the sound of playing in front of tons of vintage analog tape. Hope to see you out on the road this fall! I kicked off the tour last night in Bellingham, WA and will be stopping in 27 other non-Bellingham cities over the next five weeks. Next week, I’m in Colorado with special guest Courtney Hartman opening the shows in Denver, Beaver Creek and Aspen. I'm tickled to finally return to the Cedar Cultural Center in Minneapolis and the Bowery Ballroom in NYC. Alas, there are just too many shows to call out individually. Can we agree that the concert listed on the tour page that is closest to you is by far the most important and deserves your most immediate action? My new album, Universal Favorite, is now available for pre-order, and not a moment too soon. Solo banjo album futures are the perfect safe-haven for your hard earned money in these turbulent and uncertain times. For those you of feeling bullish, you can pre-order the album as a bundle with a new Matthew Diffee designed Universal Favorite t-shirt, which perfectly captures the essence of my solo shows. All pre-orders come with immediate downloads of my new tune “Waveland” and my take on Josh Ritter’s “Folk Bloodbath.” I had the honor of getting to play "Waveland" on stage at the Ryman Auditorium in Nashville this last Saturday, as part of A Prairie Home Companion, you can watch video of that here. The official album release tour begins on March 2nd. If you just can’t wait until then, you’ll have to find a way to Hudson, NY this Friday or Cambridge, MA on Saturday. I’ll be at the beautiful Sanders Theatre, where I’m pretty sure Winston Churchill once also performed a solo banjo show. I’m incredibly lucky to have the brilliant Anaïs Mitchell kicking things off in Cambridge. New shows have been added in March and April since my last missive, so be sure to the review all the dates on the tour page to avoid living a life filled with regret. I’m thrilled to announce a new solo album, Universal Favorite, and an album release tour, both coming March 2017. I’m less thrilled to announce that 42 minutes of music is all I have to show for an entire year of my life. Finally, I have a record that I can legally refer to as a solo album, as the music on Universal Favorite is performed all by my lonesome, without any band or accompaniment. The album is a collection of new music of mine paired with some songs that other people crafted that were never properly performed or recorded. Until now. On Universal Favorite, I play banjo. I sing. I play flat-top guitar, telecaster, and some other oddball instruments. And no, that’s not a typo- I do, in fact, sing on this record. My fellow Punch Brother, Gabe Witcher, produced the record and assured me, soon after we agreed on his fee, that my singing is now safe for public consumption, thanks to my hard work and the nearly complete demonetization of the recorded music industry. Pre-order details will be announced after the holidays. In the meantime, if you’d like a sneak peek, you can stream the first track off the record, “Waveland,” right here. As of writing, YouTube comments have yet to be disabled. If you’re hell bent on spending money towards my well-being in the near term, I’d suggest buying tickets to one of the many tour dates on the tour page. Most tickets go on sale this Friday, December 9th. I’m proud to say that Universal Favorite will be my debut release on Rounder Records, an institution that has had an impact on my life on par with the Chicago Cubs, my parents, and British Knights sneakers. I’d wager that I wouldn’t be making a living playing music if it weren’t for the music propagated by Rounder over the last 36 years. So I think it’s proper that they now share some of the risk.